I do have one of David Chang’s recipes on my site, Momofuku’s Bo Ssam. It’s insanely good. But I digress, and this isn’t even a David Chang recipe. It’s Bugolgi, and is probably the most recognized of Korean dishes here in the States. Well, Bulgolgi & Kimchi. Once you try Bulgolgi, you’ll want it again and again. And again. When I’m talking Bulgolgi, I’m talking about wafer-thin slices of tender beef, marinated overnight. Then grilled (or in this case) cooked in a skillet until the edges caramelize. That marinade is going to deepen and darken and just sear itself into the meat. It’s marvelous and seems to be just the way we Americans *including me* like it! Then you’re going to serve your Bulgogi Korean Beef with lots of little dishes (maybe some Kimchi) and Ssamjang (sauce) or maybe some Gochujang or Sriracha or any Chile Paste, like we did. You might even want to add one of these spicy sauces to the marinade, although that’s probably more a U.S. thing to do. There are a number of vegetables that can go into or onto Bulgolgi, including mushrooms and thinly sliced carrots. They’re often marinated and cooked with the Bulgolgi. And of course, for the wraps, themselves, a whole array of almost anything you’d like can be set out. It seems that here in the U.S. you’re likely to find fewer veggies (and more sugar) in Bulgolgi than in Korea; at least that was my observation when reading translated google sites, not that I’m any authority…but if you’d like to stretch the meat, make it a more cost-effective and healthier meal, add more veggies. Bulgogi is traditionally grilled and many today grill over perforated grill pans. The advantage is the smoky flavor that permeates the beef. If you wish to cook indoors with a skillet, you’ll have a different but just as delish outcome. You’ll get beautifully caramilzed seared edges on that beef. Ask your butcher to cut the beef or freeze it for 20 minutes to make it easier to slice, and buy that beef on a good sale! And as mentioned in some of the notes, if you have an Asian market nearby, you can purchase the thinly sliced beef or purchase it already marinated. If you shop at an Asian market, you’ll likely find prices that are going to surprise you compared to the prices in some of our grocery stores. If you don’t have one nearby, shop carefully for that beef, watching for specials. Inexpensive cuts of beef are usually at low in the fall and at a low, also around any holiday when the fancy cuts are often served; something has to be done with the rest of the cow after the roasts are culled. Wrap the steak in plastic wrap and freeze for 20 minutes or so to firm up. Thinly slice across the grain into about ⅛-inch slices. Place the beef and sliced onion in a gallon freezer bag or a large bowl and set aside. In a food processor, combine the chunked onion, garlic, Asian pear, and grated ginger and process until it’s broken down. Add the soy sauce, vinegar, sesame oil, and sugar and pulse until combined. Pour over steak and onions and mix to combine. Add the sliced green onion and pepper and mix again. Refrigerate for 30 minutes up to overnight. When ready to cook, preheat a cast-iron pan or large skillet over high heat, work in batches or use two skillets. Add the meat, onions, and marinade to the pan. Cook, stirring constantly until the meat is cooked through, two to three minutes. Push the meat off to one side and tilt skillet so the juices flow over to the other. Nudge the skillet so the majority of the heat from the eye is over the side with most of the juices and the meat is just off the heat. Continue to cook until the juices begin to brown and caramelize. Push the cooked meat back into the now caramelized juices and continue to cook a minute or two until the meat is coated and seared with the juices, two to three more minutes. Garnish with sliced green onion and sesame seeds and serve with desired accompaniments. Note: if you wish to serve over rice, you might not want the beef/sauce caramelized as much as those juices are wonderful as they mingle with rice. 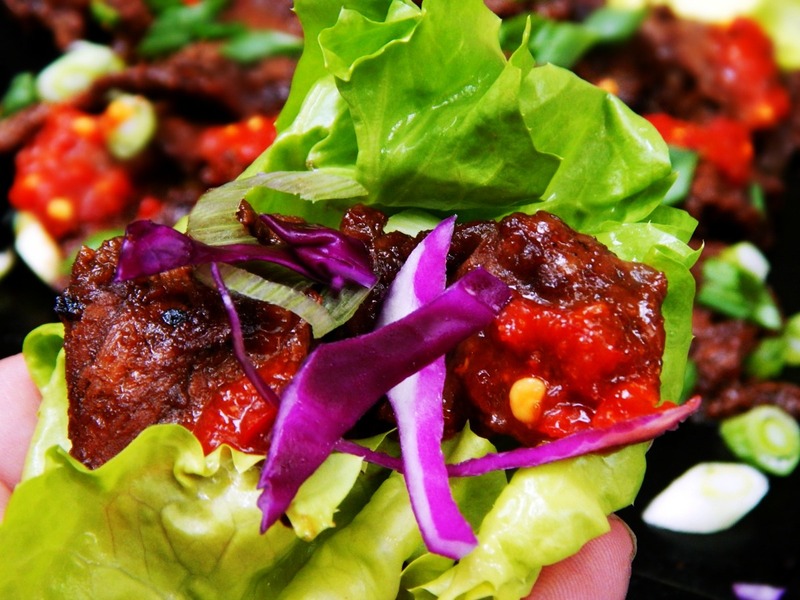 I’ll be sharing Bulgogi Korean Beef on Fiesta Friday #138 , Angie’s Link Party – and I’m hosting this week with the incomparable Johanna of French Gardener Dishes. This entry was posted in Click here for Bargain Meals, Click here for Fabulous Food Posts and tagged Asian, Bargain Meal of the Week, Beef, Bulgolgi, Cabbage, Green Onion, Hot Peppers, Korean, Korean Beef, Lettuce, lettuce wraps, Pear, Rice, Sirloin. Bookmark the permalink. Waw. Nice. Where u know with bulgogi? My sister told me about it! My pleasure, Angie! Aren’t you lucky to live so close! And to have it premarinated and sliced! I haven’t put it on the grill yet, coz I love how caramelized it gets in the pan, but do you use one of those perforated grill pans? It’s not that close, 30 mins ride but hey, beggars can’t be choosers, and yes I have one of those grill topper pans for vegetables that I use when grilling bulgogi. But I’ve been looking for a table top grill, just like the ones they use at Korean BBQ restaurants. But then, I’ll need to cut a hole in my table!! I always wanted one of those for outside, lol!! Me, too! One for outside, one for inside, haha! Totally drooling over this. The photo’s are calling my name… To bad it’s to late at night and I am to far from any stores to make this dish a reality tonight! I do think Korean food is trending Mollie. I have to give it a try. Had a similar beef made by a Korean friend and it was served wrapped in lettuce. So tender and flavorful. I will give this a try it looks too good. It’s a really fun recipe – I can’t wait to try this on a grill, too! My mom’s go-to dish for company for my entire childhood was Korean beef! To this day, she still makes it- but often substitutes chicken. She was SO ahead of her time! Your version looks delicious! I know just what you mean, and don’t forget the tater tot casserole or pork chops covered in mushroom soup! But my Mom watched the Galloping Gourmet and you never knew when she’d make some wild departure from the norm!! Methinks my husband would like this – I’ll have to give it a go! Thanks for the recipe! My son sure did!! 🙂 And it was my pleasure. Wow this looks fantastic Mollie! I’d probably like it over shredded cabbage. And definite YES on the Sambal Oelek! Yummm! Ummm, we started out with wraps and then just kept nibbling on the meat, lol! And I’m not a huge meat eater, so it says a lot! Love the photos!!! Looks delish! I’m guessing you mean my Gibson, on my profile pic? Yes, he was my 97 pound American Field lab, a “Dudley” with a pink nose. He passed away in early June. My heart is still broken, although I have a new puppy, now, Chance. You might be interested to know that he was trained first as a therapy dog and we did a lot of visiting, but then later he was specifically trained (and his training documented) as a service dog for me…but he was a very special case, extremely bright, winning personality. I know it’s not the normal “career path” for a service animal. I’ve had Korean bulgogi a few times at one of those Mongolian wok type places where you select your meats, condiments and veggies and they cook it for you and when I tried to make it myself, my beef was too thick and ended up tough and chewy. The flavour was good though. Is that sambal oelek on the finished dish? Excellent dish! I love the bright colours. Isn’t that chili sauce wild? It is! Not sure I’d be able to find it round here. They don’t do it anymore. They are thinking of a fall festival but we’ll see. Oh what a shame its been ruined.